When searching for the ideal property to buy, aspiring homeowners may be faced with a choice: leasehold vs. freehold. What are the differences? The main difference between leasehold and freehold is that if you buy a leasehold property, you own the property but not the land it stands on. With a freehold property, you own both the building and the land. In England and Wales, the majority of flats are leasehold, while houses are usually sold as freehold properties. With leasehold properties, the land the building stands on is owned by a landlord, also known as the freeholder. You will own the property for the length of a lease agreement with the freeholder. After the lease expires, ownership of the property will revert back to the freeholder. You’ll pay ground rent to the freeholder, although this usually won’t be very much. The freeholder will also be responsible for maintaining and running the building, so you can expect to pay a service charge to contribute to the cost of this. When you buy a freehold property, you’ll own the dwelling and the land it stands on outright. There will be no time limit on your ownership, so you won’t have to worry about a lease running out. You’ll be responsible for maintaining the building and any related costs, but this will mean you’ll be free to do whatever you like to the property (subject to planning permission). Buying a home is an exciting step, but it is very important to understand any impending issues surrounding property ownership. 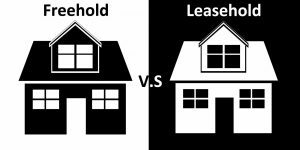 When it comes to leasehold vs. freehold, the main difference is that as a freeholder you’ll own your property outright from the get go, while as a leaseholder your ownership will be limited to a set length of time. If you want to know more about buying a home, get in touch with our team today; we are more than happy to help!